After any catastrophe, there’s a moment when life returns to ‘normal’ and for a lot of people, it seems like that moment is now-ish. Pretty soon we’ll all get swept up in the holidays and before you know it, it’s March. Time marches on, we get used to the ‘new normal’ and our indignation fades into quiet hopelessness and ignorance-is-bliss. 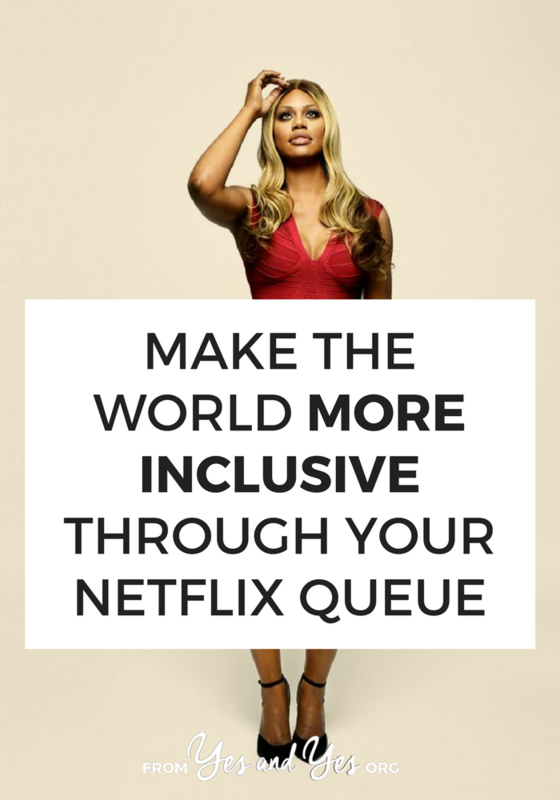 So right now, while we’re really feeling it, let’s all take a minute to set up monthly, auto-deducted donations to organizations that serve marginalized people. It’s awesome to make a big, one-time donation to Planned Parenthood or the ACLU! But did you know that when you become a sustaining supporter of a NGO your donation goes further? They can spend less time, money, and energy on fundraising because they have a better idea of their budget? Even if you voted for Trump – because Obamacare failed you or you’re pro-life – I imagine you disagree with some of his proposed policy changes. Like how he doesn’t believe global warming is real? If everyone who read this blog daily set up a $5 monthly donation THAT WOULD BE $65,000 A MONTH to support good, important causes. Does this mean we can ‘set it and forget it’ with our political and community involvement? Of course not, but it’s one tiny step we can take to make sure we’re putting our money where our beliefs are well beyond November. Here’s a great round up of pro-women, pro-immigrant, pro-earth, anti-bigotry organizations that need your support. P.S. 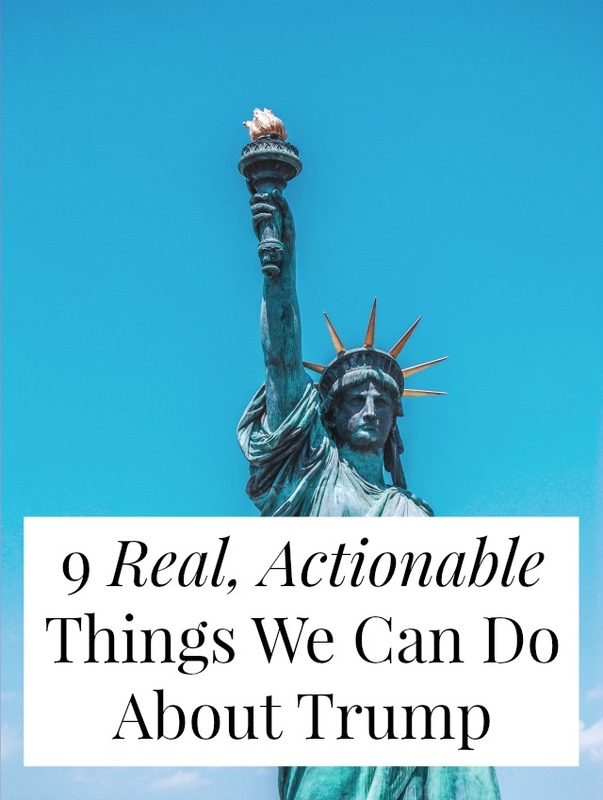 19 tiny things you can do to make the world a better place. Friends, I self-medicate by making lists and plans. Last night, as the election results rolled in, I took a shower and sat in bed with my laptop, listing out all the ways we could deal with this new world order. Guys, let’s talk about Chrome plugins. They’re free, they’re super easy to install and use and they can totally change your business, your productivity, even how much money you spend! My own list of favorite plugins begins and ends with Block Site, so when Erin offered to share the six plugins that help her run her VA business, I was all ears! Friends, I have been holding out on you. Yes, I’ve shared my “secrets” about which jeans you should buy, how you can travel for 11 months on $5,000, and how to be less annoyed with everyone. 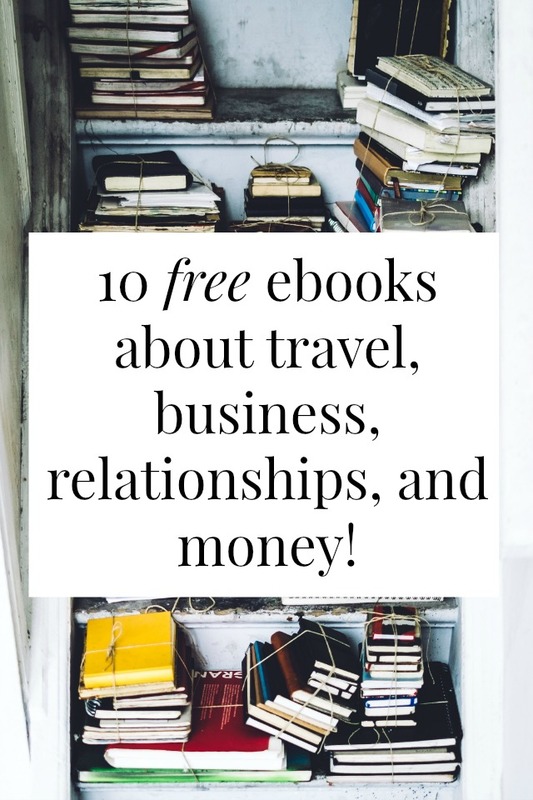 I’ve compiled all my best stuff into a series of ebooks but – up until now – those ebooks have been scattered around the internet. Sometimes I promote them, sometimes I forget about them, sometimes I link to them in one blog post buried deep in my archives. No more! Now all of my best stuff lives in this awesome library. You can get them all in one place! And when I make new things, I’ll put them there and you’ll always have access! If you’re like “Yawn. Who cares, Von Bargen? I AM DEEPLY OVER EBOOKS” let me convince you, dear skeptical one! This ain’t no “rehashing a blog post, adding photos, and calling it an ebook” ish. These books go deeper and more in depth than any blog post can. I share tips, ideas, and personal stories that aren’t necessarily blog fodder. 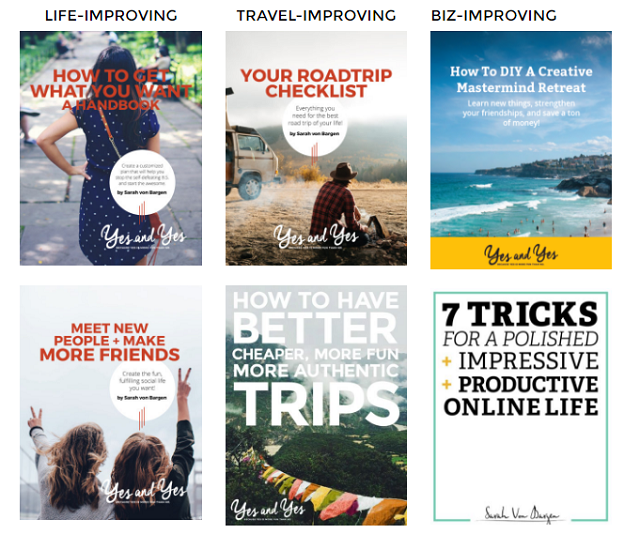 There’s space for taking notes, journaling, and I walk you through interactive exercises that will help you enjoy any trip, save money, make more friends – tons of stuff! You don’t have to print anything out! You don’t have to look at your screen and then scribble into a half-filled legal pad! You can type right into these workbooks, save them to your desktop, and then come back when you have a new insight! So how do you get these workbooks? Make sure to check your Spam folder and ‘Promotions’ folder if you don’t hear from me within an hour or two! Have at it! Download, fill in, and start making ish happen. If you found these workbooks particularly helpful, I’m be so grateful if you helped spread the word. As always, a huge, HUGE thank you for making Yes & Yes part of your online life. You guys are The Actual Best. P.S. If you think my ebooks are beautiful and well-designed, that’s thanks to Elise Epp and Susannah Brinkley. Go hire them! I would imagine that pretty much everyone reading this wants to make the world a better, kinder, more inclusive place. And there are so many ways we can do that! We can support companies that use safe, fair workplace practices. 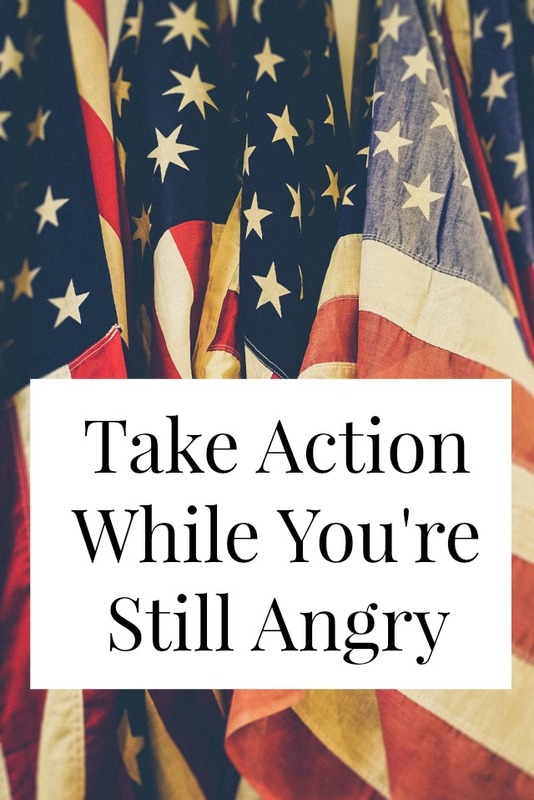 We can contact our politicians and make our voices heard. We can make dietary choices that are better for the planet.